Let’s take a brief moment to acknowledge that, yes—the concept of schadenfreude has been embodied as an imploding Bahamas music festival, and its dysfunction is modern legend. So please, take a moment to laugh at the trust-fund bros currently fending off wild dogs and lamenting the cheese sandwiches most journalists consume daily. Get it out of your system? Good. Because one of the most successful, colorful and downright likable music experiences is celebrating its 48th year of existence this weekend. And it deserves your attention. 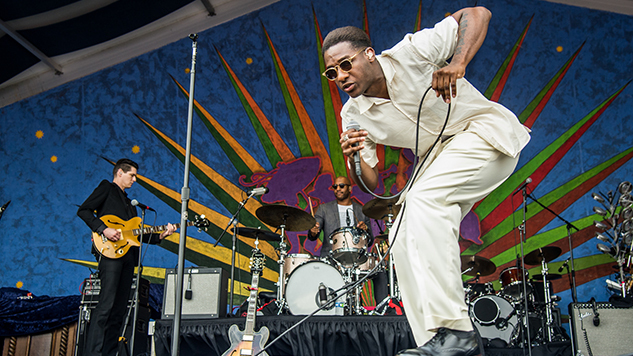 The New Orleans Jazz & Heritage Festival kicked off yesterday with sets from Aaron Neville, Harry Connick Jr., NAS, Leon Bridges, the Trey Anastasio Band and roughly 65 other acts. Centered around funk, soul, blues, jazz, international and beyond, the event offers a purer distillation of the summer music village, amplified over seven days at the Fair Grounds Race Course. Check out Amy Harris’ photo coverage from yesterday and check back for more pics of New Orleans Jazz Fest 2017.